Gold in Massachusetts is primarily very fine, deposited by receding glaciers many years ago. Don’t expect to hit the “Mother Lode” here, but some gold does exist here. Most documented gold occurrences are on the western side of the state. Search the creeks around Westfield, Massachusetts and areas on the eastern side of the Berkshire Mountains. The Berkshire River is reported to have small occurrences of placer gold, as well as Mill River further to the west. Slightly further to the north, the Westfield River, as well as Couch Brook also has reports of some fine flakes being recovered. The northwestern part of Massachusetts also holds gold, including Couch Brook and Deerfield River along with its tributaries. 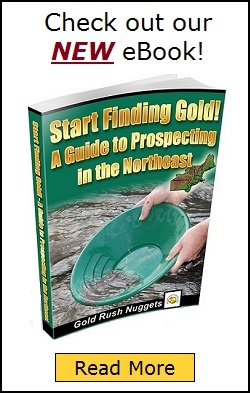 Don’t expect large nuggets, as almost all gold found in Massachusetts is very small in size. Carefully panning is required to retain the very fine gold. There has been no mining done on a commercial scale here, but there is potential for a hard working recreational prospector to find a bit of “color” in the bottom of your gold pan. If you already live in Massachusetts, it may also be worth researching more substantial gold that has been found in nearby states such as Maine and Vermont. The vast majority of gold in the northeastern states is what is known as “glacial gold”. Basically what this means is that gold was carried south by massive glaciers thousands of years ago. This moved richer gold bearing gravels south from Canada. As the glaciers receded, small amounts of this gravel were deposited, scattering them throughout many states including Massachusetts. This accounts for the often random and widespread gold that are found. Since the gold is generally extremely small, skillful panning is required to retain this fine gold. Using specialized equipment like spiral panning machines will also increase a prospectors chances of holding onto these tiniest bits of gold.